Marcus and I decided to take Pam and Bill out for dinner on Friday at 54 Mint in SOMA, a neighborhood in San Francisco that stands for "SOuth of MArket Street." 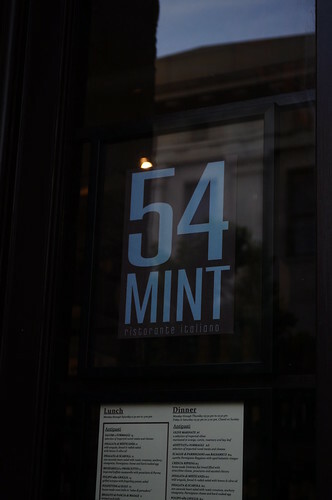 Despite being located at 16 Mint Plaza, the restaurant's name comes from the original address of the restaurant's space (i.e., 54 Mint) before the city renumbered the area in SOMA. I first heard about 54 Mint in an online article in Gentleman's Quarterly (GQ) magazine back in January 2010. The article the "10 Best New Restaurants in America," noting 54 Mint as one of those ranked. I thought the restaurant's space looked quite interesting, and its menu had items that seemed original and different from the typical menus at the average Italian restaurant. Per GQ, "three not-so-young Italian guys got together and opened a not-so-great-looking wine bar in a downtown plaza. The decor: wooden tables, pots, vases, food products. Not so promising, right? Don't underestimate old Italians. They can make any dish seem uncomplicated and natural, no matter how many ingredients it contains. It's not only the food that seems Italian; the three guys are swell to customers, which is how guys who grew up in or around the south side of Italy are expected to act." 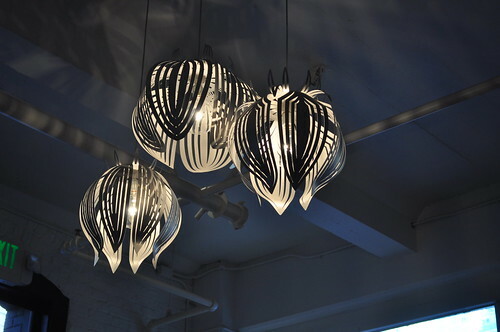 I thought these abstract, budding flower lamps were a nice modern touch to the space. 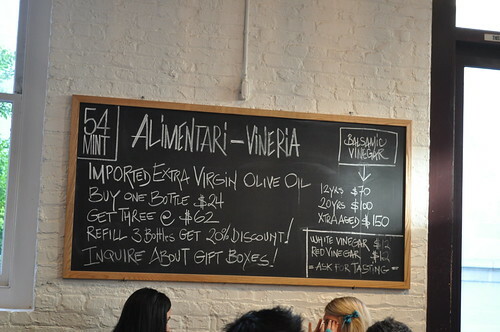 Not only is 54 Mint a ristorante, it is also a vineria (i.e., Italian for "wine bar") and a place to find specialty food items, alimentari (i.e., Italian for "food"), like salts, vinegars, olive oils, pastas, etc. 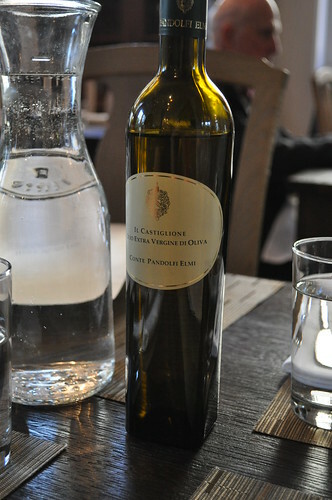 One of the alimentari offered for sale and on each dining table--imported extra virgin olive oil! 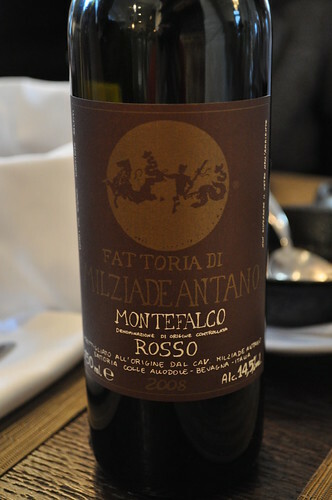 We shared a bottle of red wine, Rosso di Montefalco produced by Milziade Antano with a 2008 vintage, as recommended by our server. When we had our first taste of the wine, without having any food yet, the wine seemed a little subdued, but once we let it aerate and paired it with the heartier meats and sauces from our main courses, it tasted smoother and had a little more character than when it was first opened. 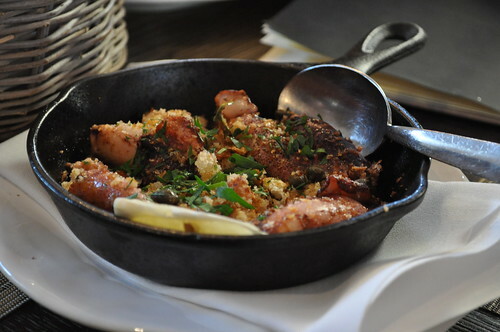 We started off our dinner with pan-fried calamari with smoked paprika, capers, garlic, and bread crumbs. I really liked the texture of the calamari--it was cooked to the right temperature creating a soft, edible texture that doesn't require lots of chewing. I also liked the addition of the bread crumbs, making it almost like a fried calamari, but slightly deconstructed and with more flavor. For Marcus, it was the most interesting "take" on calamari he has had to date (I should mention that calamari is his "anchor" dish that he tends to order at most restaurants, if he sees it on the menu--it's his personal benchmark to comparatively measure restaurant to restaurant). Maybe it is because I still find capers very potent and overpowering in flavor, but I felt that the capers overshadowed the other flavors as well as the combined effect on the calamari. Perhaps it is a flavor and taste that I'll need to acquire over time, but I think I could've done without the capers. Pam and Bill ordered the fava bean salad with ricotta and shaved Parmesan from 54 Mint's daily specials, as fava beans are in season currently. They really enjoyed this dish overall. 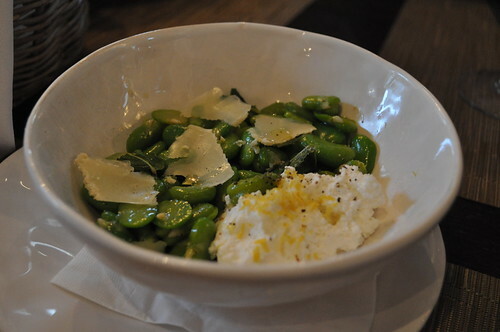 For me, I enjoyed the fava beans, but the ricotta and Parmesan were a little too much for me (from a dairy and flavor standpoint). So if you're a cheese lover, this is a great salad to start off your dinner. 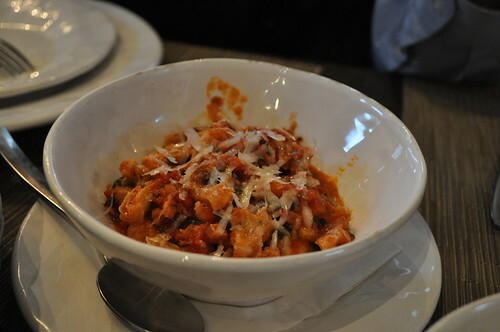 We also went with another starter from the daily special offerings, per an insistent recommendation from our server--tripe in tomato sauce, pancetta, white wine, and fresh pecorino. I totally fell in love with this dish. The first thing I'd like to note here is that not many places, from my own experience (particularly non-Asian ones), know how to prepare tripe to its maximum potential. However, 54 Mint changed this for me after immediately trying a bite of this tripe dish. The tripe was cooked to its optimal texture--soft and the right amount of chew. The tomato sauce was sweet and hearty--you know, the kind of sauce in which you want to soak a fresh loaf of bread. The pancetta and white wine gave additional fragrance and depth of flavor to the sauce as well. I thought the pecorino would mask the entire dish with its cheesiness, but I actually didn't mind i being slightly melted over the top of the tripe in sauce. So our verdict--our server was right on target with this one. You'd be silly not to order this for the table. 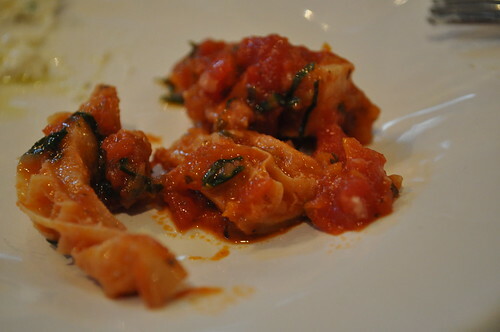 Close up of the tripe and the delicious sauce in which it was cooked. With the main courses, we shared them family-style. 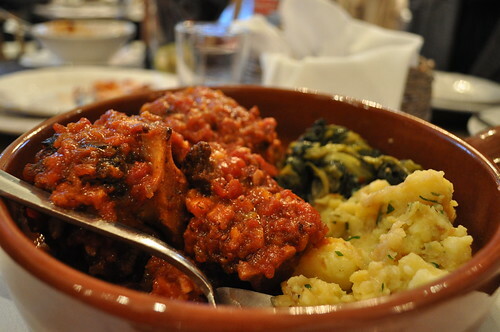 This was the Roman oxtail in tomato sauce with pancetta and celery along with a side of crushed potatoes and sautéed escarole. The tomato sauce was really great here too (with more focus on the salty flavors than the sweetness found in the sauce from the tripe). The meat from the oxtail fell right off the bone (so amazing--no other way to describe it best), and having it with the starchy, lumpy crushed potatoes (love that rustic texture) made it even better. This one definitely one of my favorites at 54 Mint. 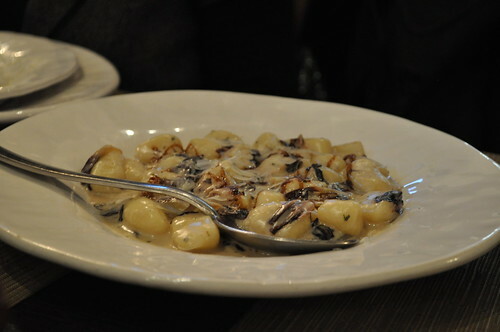 Also from the daily specials was this gnocchi with gorgonzola. It was soft and creamy with the potato interior melting in your mouth, requiring very few chews. I found the gorgonzola on the heavier cheesy side, so I only was able to take a few bites, but Marcus, Bill, and Pam said the gnocchi was great. 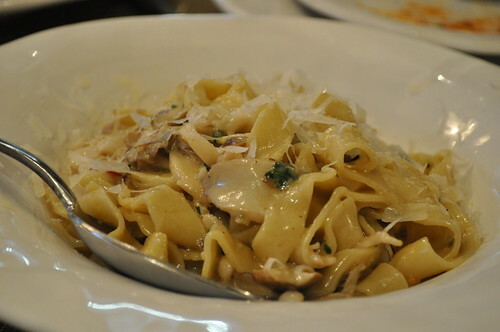 My other favorite from the dinner was the fettuccine ai funghi, a house-made egg pasta with wild mushroom ragù. The fettuccine had a great al dente temperature with the fragrant egg flavor and the added bonus of being made in-house. Plus, adding wild mushrooms to any dish is bound to make it up to the top of my list! The ragù was creamy but light (not drowning the pasta). I even let myself be adventurous--I let them sprinkle shredded Italian cheese on top, and it didn't ruin the dish for me! Very proud of myself for not getting clouded by my personal hangups with certain foods and the dinner at hand. We also had the bistecca, an 11-ounce natural strip steak served with radicchio trevisano salad, roasted garlic, and balsamic vinegar. We all found the meat of the steak to be really tender--a really nice medium-rare center. But surprisingly, we found the radicchio trevisano (i.e., radicchio coming from the Italian region of Treviso) salad to be really great, primarily due to the aged balsamic vinegar drizzled over it. 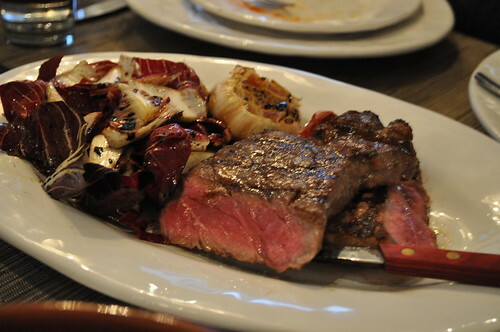 It gave the slightly bitter radicchio greens a little vinegary zing--both refreshing and biting, making for a great contrast to the hearty, rich tasting strip steak. 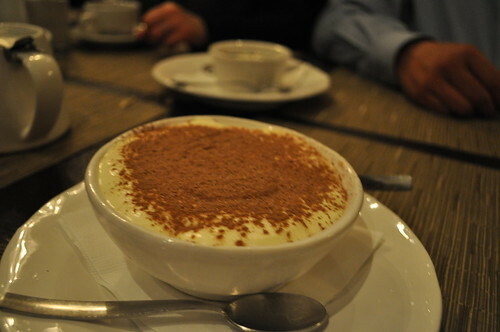 Marcus and I shared a tiramisu. The marscarpone was lightly whipped and fluffy and the Kahlua-soaked lady fingers at the bottom were moist--not soggy at all. A very nice ending to a filling Italian dinner. 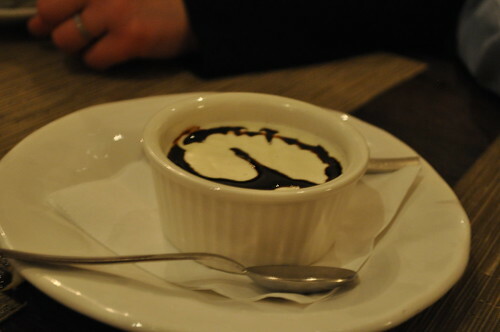 Bill and Pam shared the pannacotta al balsamico, a panna cotta served with aged balsamic vinegar. I snuck a taste of this creamy gelatinous dessert with a bit of balsamic vinegar, and its delightful taste was unexpected. I wasn't sure how a dessert could fuse well with the tangy sweet and tart flavor of a balsamic vinegar, but it thoroughly disproved my preconceptions. A combination of milky creaminess and vinegary tartness made for a sweet ending to an otherwise heavy dinner. Findings: The four of us enjoyed our dinner at 54 Mint. Our server was very helpful, particularly insisting on us ordering the tripe and the fettuccine ai funghi, which were my favorites of the night (along with the Roman oxtail). The dishes we had seemed truly Italian, which I really admire, as I'm a little bit tired of seeing the overplayed, and what I feel to be overly Americanized, Italian cuisine menu items like chicken parmagiana, penne alla vodka, etc. 54 Mint truly transports you back to the hearty and rustic Italian fare you'd expect yourself to stumble upon in Italy, only sourced with the local ingredients from the Bay Area. The restaurant has a very relaxed atmosphere--the best kind of place to go to with friends for a nice dinner to share a bottle of wine or two. Price point: $12-18 for each antipasta, $16-30 for each of the primi e secondi courses, $7-8 for each dessert.